"Pull-apart and monkey breads don't have to be sweet! 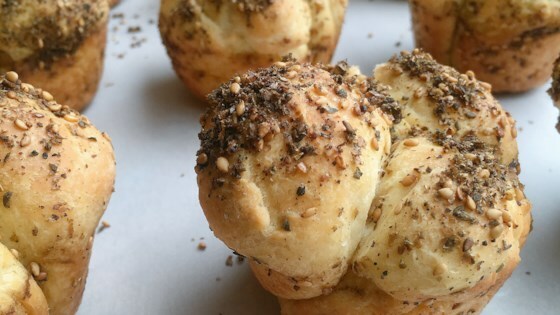 This simple homemade dough is dipped in za'atar (a delicious Middle Eastern herb mix) and baked in a muffin tin. Great served with labneh, olives, and fresh mint for brunch!" Combine warm milk, yeast, and sugar in the bowl of a stand mixer fitted with the paddle attachment. Let stand until mixture is foamy, 5 to 10 minutes. Beat milk mixture on low speed. Add 1 cup flour, beating just until combined. Add melted butter, 2 tablespoons olive oil, and 1/2 cup flour; beat until combined. Beat in eggs. Add remaining 1 3/4 cups flour and salt. Beat until a soft, sticky dough forms. Spray a large bowl with cooking spray; add dough. Cover loosely and let rise until doubled in size, about 1 hour. Preheat oven to 350 degrees F (175 degrees C). Grease a 12-cup muffin tin with cooking spray. Punch dough down gently. Pinch off 36 small pieces of dough and roll into balls. Whisk 6 tablespoons za'atar and 1/3 cup olive oil together in a bowl. Immerse dough balls in oil mixture to coat all sides. Arrange 3 dough balls in each muffin cup. Sprinkle remaining 2 tablespoons za'atar over dough. Cover muffin tin loosely with greased plastic wrap. Let rise until dough balls puff up over the rim of the tin, about 25 minutes. Bake in the preheated oven until puffed up and golden, about 25 minutes. Cool for 5 minutes in the pan. Lift out of the pan and cool briefly on a wire rack, about 5 minutes more. Came out little dry. I recommend more olive oil to roll balls in.